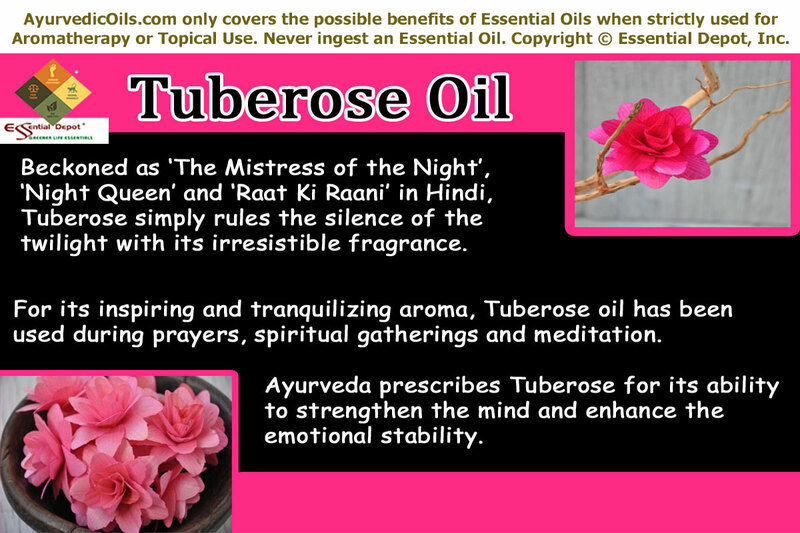 What more is needed to prove the mesmerizing aroma of Tuberose oil when it has the word ‘rose’ as a part of its name? Yes! Tuberose absolute oil is one such mythological oil known for its magnificence, floral and sensual aroma. Popularly known with various names like ‘The Mistress of the Night’, ‘Night Queen’ and ‘Raat Ki Raani’ in Hindi, this flower is said to rule the silence of the twilight with its irresistible fragrance. Ayurveda, the ancient system of healing humanity employs natural remedies to empower the five senses such as smell, touch, taste, sound and colors for harmonious living. With smell being the primary one this ‘Mother of all healing sciences’ use aromatics to heal and prevent illnesses. This is the major reason for using incense, flowers, attars, fragrance oils and aromatic essential oils during prayers, spiritual gatherings and meditation. Tuberose oil has been used in making attars that are apprehended in high regard in Ayurvedic medication for their ability to strengthen the mind and enhance the emotional stability. Botanically known as Polianthes tuberosa, this plant is a member of the Amaryllis family and is indigenous to Central America. The early Aztec healers called Tuberose absolute as omixochitl, meaning bone flower mainly because of its radiant white and waxy flowers that stood stiff and strong just like bones. It is also known as the favorite flower of the Mexicans and it was added to chocolate drinks. In certain cultures unmarried girls are advised not to smell the fragrance of Tuberose absolute flowers after sunset, due to its strong aphrodisiac properties. Tuberose flowers are a vital part of the traditional Hawaiian weddings where these flowers are intermingled with Plumeria flowers for an elegant, rich, exquisite and an aromatic wedding garland. The brides of Hawaii wear Haku meaning a wreath around their crown, which is made up of Tuberose flowers and pikaki. This is mainly to bring joy, harmony and intimacy as well as to give a great start to the newly married couple. The ancient Victorians attributed the fragrance of Tuberose flowers to sensual and voluptuous qualities and on the other hand certain Victorians also called Tuberose as funeral flower. Tuberose absolute is called as Rajnigandha in Ayurveda meaning ‘night fragrance’. The flowers of this plant bloom during the night time and release their scent for attracting the attention of nocturnal moths for pollination. Just like Jasmine, tuberose also has a strong floral scent that is effective even hours after plucking it. Essential oils have been used for their aroma and therapeutic values by priests, devotees and worshipers to draw the attention of Gods, Goddesses and Spirits, to ward off evil powers and to sanctify the places of worships. In this way, the aroma of Tuberose absolute oil with Venus as the guiding planet is said to be the blessed oil to Maya who is respected as the origin of Gods. This oil was also used in the primordial times for opening the heart chakra, capturing compassion, vision, love, psychic sensitivity, creativity and trance work. Ayurveda’s use of aromatics as an aphrodisiac, stimulant, sedative, calmative and as a natural remedy for various psycho-spiritual conditions is well-known. According to Ayurveda, the aroma of Tuberose absolute oil is said to open the crown chakra, which is responsible for augmenting creative powers, peacefulness of the mind, intensify the emotional powers and strengthen the psychic potential. The sweet-smelling oil of Tuberose flowers is proven to possess anti-bacterial and anti-fungal properties, making it as one among the perfect medicated oil for use. A prominent study on ‘Antibacterial Activity of Essential Oils from Palmarosa, Evening Primrose, Lavender and Tuberose’ proved that Tuberose absolute oil was effective in treating gram positive and gram negative bacteria. Another study on ‘Anti-fungal activity of tuberose absolute and some of its constituents’ proved that the three constituents present in Tuberose absolute namely indole, geraniol and methyl anthranilate revealed effectiveness against the mycelia growth of Colletotrichum gloeosporioides on potato-dextrose-agar medium. 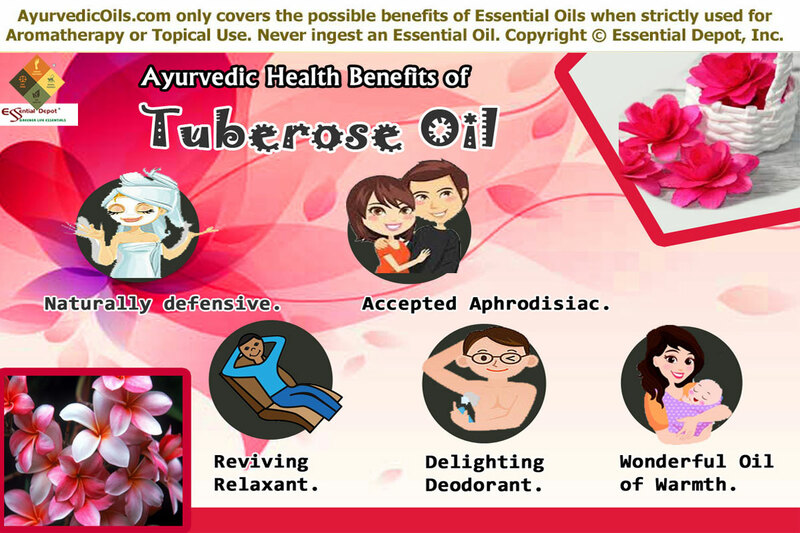 Tuberose absolute oil is a time-honored aphrodisiac with narcotic properties. This is proven with its romantic name ‘Fragrance of the night’, ‘Night Queen’ and certain others. Inhaling the aroma of this mind-blowing oil or taking a fragrant warm bath before bed with 2 or 3 drops of Tuberose absolute oil added to your bathing water can do the magic for you. This is done by the function of the aromatic compounds that reaches the limbic system of your brain through your nasal passages. This part of the brain is responsible for controlling emotions, sexual feelings and stimulating your system. The warm, floral, deep, honey-like aroma encircles your room and your mind, leaving behind a perfect ambiance for love. The therapeutic properties of this oil enhances blood circulation of the body and assists in treating lack of libido, erectile dysfunction and lack of sexual interest. It grants you complete repose and is also said to treat frigidity and impotence due to lack to sexual health and drive. The pleasing and satisfying aroma of this oil aids in relieving tension, stress and anxiety. Experiencing the tranquilizing fragrance of this oil relaxes the nerves and muscles, soothes the senses and appeases the brain. This assists in alleviating anger and other negative feelings by intensifying your emotions and granting peace of mind. The long-lasting fragrance of Tuberose absolute oil makes it a perfect pick for dealing with problems like body odor due to the presence of bacteria in the sweat especially in tropical countries. It is for this unique reason, tuberose absolute oil has been in use in the perfume industry for ages together. The most celebrated perfumes with the notes of Tuberose absolute oil are Fracas de Robert Piguet, April Aromatics from Natural Perfumer Tanja Bochnig, Nasomatto Narcotic Venus, Forbidden with tuberose and wormwood, Tallulah, Christian Dior Poison, Creed Tubereuse Indiana, Chanel Gardénia, Les Parfums de Rosine Mea Culpa and much more. The warming quality of this oil stimulates blood circulation and helps you in keeping your body warm by granting sufficient heat to your body. 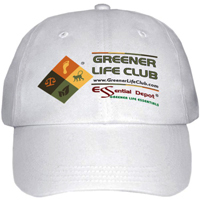 This gives you a feeling of security as it is trusted to embrace the person who wears it. Using this oil in your massage blend aids you in managing cold during winters, treats cracks on dried skin, protects the respiratory system and prevents the formation catarrh and phlegm. Tuberose absolute oil also has sedative, anti-inflammatory and anti-spasmodic properties that aids in treating muscular pains, spasms, skin infections, nausea and certain other health conditions. You can also use it as a soothing massage oil by adding 3 to 4 drops of Tuberose oil to your favorite carrier oil like jojoba oil and enliven your senses with a warm massage. For your information: It approximately requires 3500 pounds of handpicked Tuberose flowers to extract 1 pound of Tuberose absolute oil and this noteworthy reason makes it the most expensive oil on this universe. Unlike other essential oils, tuberose oil is not extracted through steam distillation process as it cannot withstand high temperatures and it is extracted by enfleurage, which is a gentle but labor intensive process. Disclaimer: This information is only for educational purposes and is not deliberated to diagnose any health condition. Essential oils are highly concentrated liquids and never take them internally without the guidance of your Ayurvedic Practitioner. 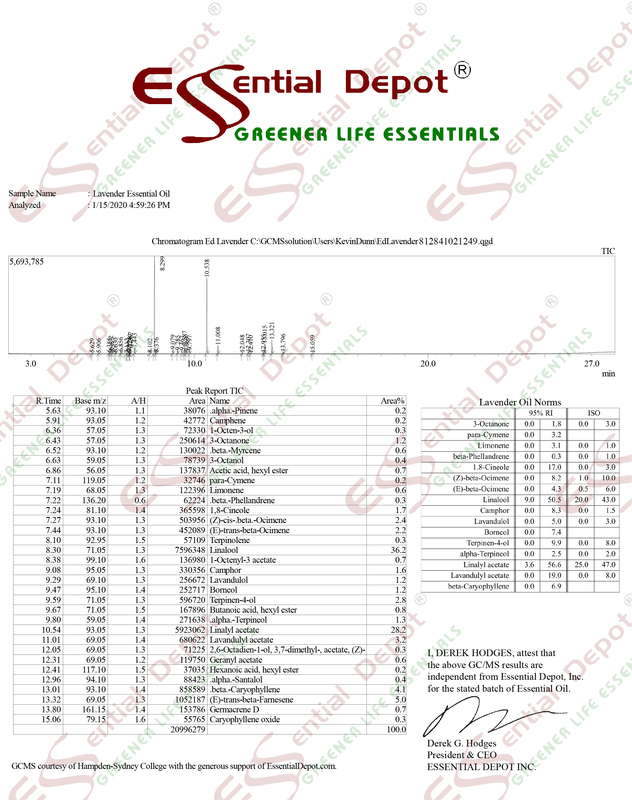 Blend essential oils with appropriate carrier oils before using them topically and keep away from children.